It isn't often that I step in front of the camera. I wouldn't say I'm camera shy, but I would say that I prefer to stay behind the scenes. However, my husband and I recently celebrated our five year wedding anniversary. So much can change in the time that you're married and the wedding can seem like a distant memory from the past. 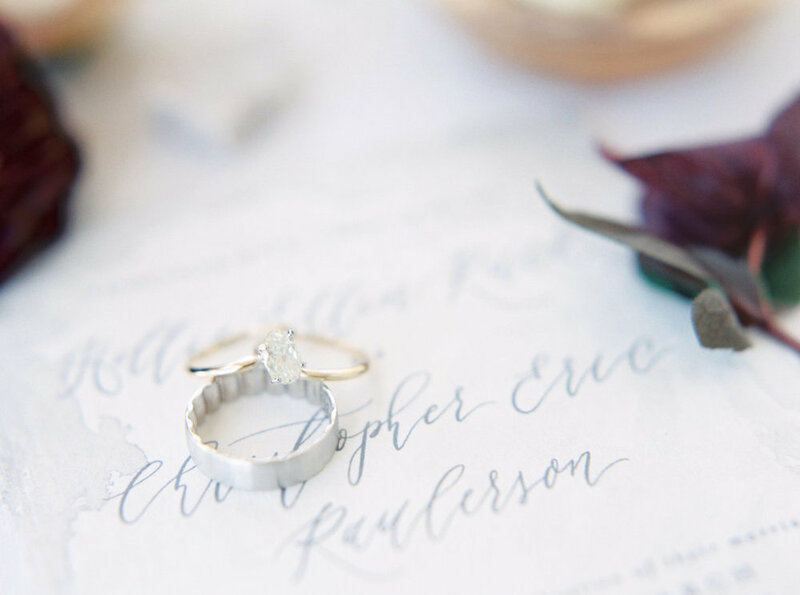 Being in the wedding industry, I feel fortunate that I have a knack for remembering details. But, that also means that I look back on our wedding day and wish we had done a few things differently. Mainly, booked a different photographer and a planner (yes, I admit, I didn't have one). As they say, hindsight is 20/20 and this is one of the reasons I talk about the importance of hiring an amazing team that includes a planner, experienced photographer, and videographer! All that said, this occasion was a great opportunity to recreate portions of the day with a more intimate feel. And something that reflects our current tastes. The property we were on belongs to my parents. We were actually married at his parent property which is very similar. And those three cows you see behind us? They were wedding gifts from a dear friend 5 years ago! lol! There are actually three more of them that aren't pictured. If you want to talk about a wedding gift that keeps on giving, cows are it! Ha! They keep having babies, which we actually are able to sell. Sounds crazy, but it's a quirky thing that makes us laugh. Alicia from On Three recreated our original invitations for us so it would be a more current aesthetic. She did such an amazing job. My hair and makeup was done by my good friend who did it for our wedding too. The banner you see us holding is filled with words from our first dance (which Eric originally picked as a surprise). Speaking of surprises, the Hubs upgraded my ring this year! Now, this is where I get mushy. I still love this man as much as I did on the wedding day. In fact, more. So despite not having the wedding of our dreams then, we feel grateful for today. And the perks of knowing some of the best wedding professionals around! Photo: @hunterryanphoto Styling & Bouquet: @ellesonevents Dress: @asos Tux: @blacktietuxedos Cake: @kakesbykaren (we messed the cake up a little so, she may not want to be tagged :-/ Paper: @onthreedesigns Hair: thairapybyaimee Makeup: mes.amies.spa Ring: @diamonddistrictusa "